History: The race for the sterling silver service set held in late November brings together all phases of the midshipman sailing squadron. the race is sailed in offshore boats with crews representing the dinghies, plebes, VOST, faculty, NASS, sail craft department, and coaches staff. Captain Robert Dache Steele, USN, class of 1945 was the Commodore of NASS and commanding officer of the Naval Station, Annapolis, from 1969 to 1972. As a tribute to him for his deep concern for the welfare of the midshipman, the sailing center staff and coaches organized this regatta in his honor. Upon the death of Robert Huntington, Jr. in 1973, Captain Steele graciously rededicated the Robert D. Steele regatta to the memory of his friend. Awarded to the winning skipper of the Reina Mercedes Regatta typically held in Navy Knockabouts. Awarded annually to the civilian volunteer member of the NASS who has made exemplary contributions to the mission and programs of the sailing squadron. The CAPT A.G.B Grosvenor Trophy was established by the Fales Committee in 1978 to honor the late Captain Alexander G. Bell Grosvenor, USNA Class of 1950, Commanding Officer, Naval Station Annapolis, and Commodore, Naval Academy Sailing Squadron. 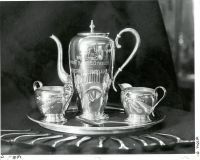 Captain Grosvenor had noted that of all the sailing-oriented trophies awarded at the Naval Academy, none honored the hard working and dedicated volunteers from the Naval Academy Sailing Squadron. The perpetual trophy on display in the Crown Center Hall of Fame is a fully rigged half-model of the sailing vessel SIREN, a custom-built Sparkman & Stephens 58-foot sloop aboard which Captain Grosvenor served as Head Coach. 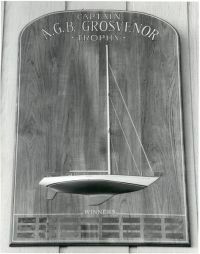 In the spring of 2003, the Fales Committee re-dedicated the Grosvenor Trophy as the Alex and Marcia Grosvenor Trophy. The renamed trophy recognizes and honors the extraordinary time, effort, and energy that both Captain and Mrs. Grosvenor devoted in supporting all aspects of the Naval Academy sailing programs.